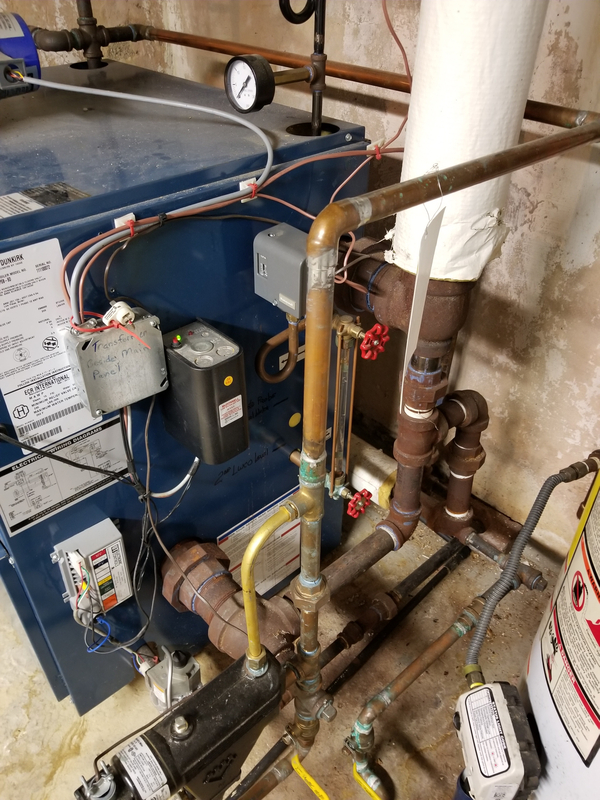 Over the past few weeks I've noticed something rather strange going on with my single pipe steam system. When it kicks on I get lots of what sounds like thermal expansion. Not the normal pop or two, but clangs throughout the entire house that almost seem random. It lasts for the first 5-10 minutes. "Pop...pop.pop....pop........pop" all from different radiators. I have never had this much of it before and I'm not really sure what to do. I thought through checking the level of each radiator, but it seems strange that 6-8 radiators would all of the sudden start a random chorus of thermal expansion clanging. An interesting note - it appears to only happen on 1 side of the house. I do have 2 steam lines - 1 serving the front of the house and another serving the rear. I don't think I've heard it at all on the rear. I did recently have a pro out to help look at some water hammering. We think it's happening because the floor has sagged where the main lines return. The pro did mess around some under the house but said he didn't really do anything. I double checked the pressure to make sure he didn't mess with it, still running at 1.5psi. I did switch from some new (larger) main vents back to the original smaller ones (after I cleaned them up). The water hammer from the old ones was so intense I started to get worried. I'll swap them back once I get the sagging floor fixed. Any ideas on the new thermal expansion issue? I probably get 25-30 clangs over 5 minutes. Seems excessive and new. Install the correct vents based on the size of the pipe being vented. Check the pitch on all the piping. Has the sagging floor dropped enough that a floor joist is touching the main anywhere? Also did pro adjust pressure up? Should be 1/2 psi with 1 diff on additive or 1.5 psi cutout with 1 psi diff on subtraction style pressuretrol. Thankfully it isn't sagging that much so it isn't touching the main anywhere. About 1-2". I'm working to get that addressed. I thought that might be the case but not. The pressuretrol is additive and is set to 1/2 psi with 1 diff. Sorry if I misspoke. Something changed since he came. What is different now? That is probably the answer. 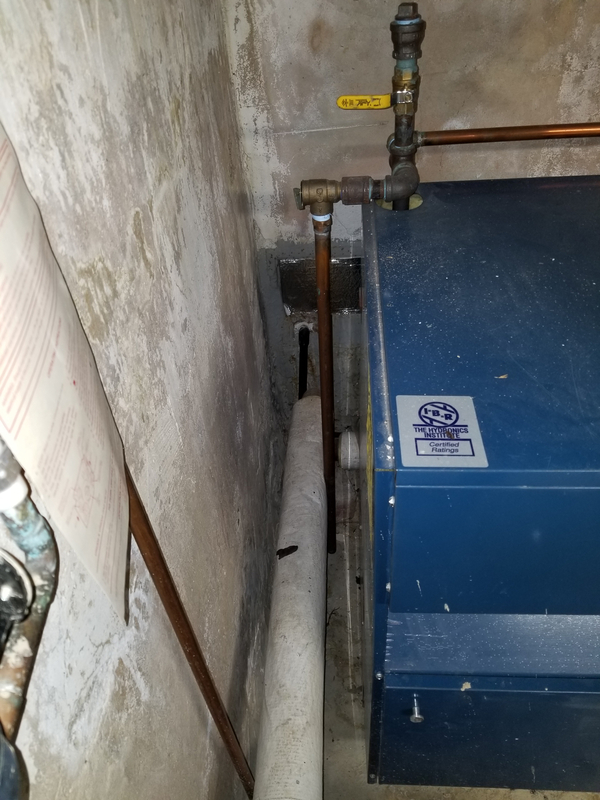 Are you sure it is expansion noise and not water hammer? I suppose the floor may be sagged enough that the supply pipe coming up, through the floor, to those radiators now rubs against the floor boards. Also, just because the Pressuretrol settings haven't been changed doesn't mean that the pigtail (looped pipe the Pressuretrol is mounted on) isn't clogged, preventing the Pressuretrol from actually seeing the system pressure. Take that off and clean it. > Something changed since he came. What is different now? That is probably the answer. That's what I've been trying to figure out. I can't seem to find anything obvious unless he messed around with the piping but didn't tell me. > Are you sure it is expansion noise and not water hammer? I suppose the floor may be sagged enough that the supply pipe coming up, through the floor, to those radiators now rubs against the floor boards. > Also, just because the Pressuretrol settings haven't been changed doesn't mean that the pigtail (looped pipe the Pressuretrol is mounted on) isn't clogged, preventing the Pressuretrol from actually seeing the system pressure. Take that off and clean it. Good call on cleaning ok it the pressuretrol, although I don't think that would explain why 1 line has the issue and the other doesn't. Attaching pics of the pressurtrol and near boiler piping. Pressure can do strange things, depending on size/length of each main, number and size of radiators connected to each main, size of supplies, the way those radiators are vented, the problem can be the same on each main but the symptoms present differently or not as obvious. Can you take a picture of your sight glass and any valves near boiler? It looks like your wet return valve is closed. Hard to see from attached pic. I'm thinking my next step will be to put the Gorton's back on to vent the main better. It will cause a pretty loud water hammer butsince that only happens when the lines are cold it will probably be more tolerable. Do I need to worry about any damage from water hammering since it's so much harder with the Gorton's? What does the ball valve on the copper lines on the bottom right go to? 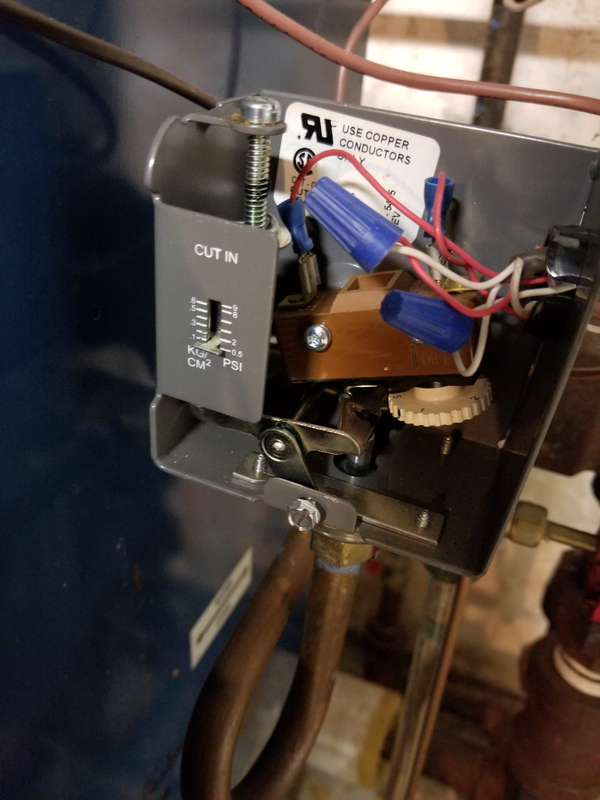 Is part of the quick fill that comes from the water heater? Is it a return line? Follow line and snap pictures. If it is a return, open it. Sight glass seems a bit high. Is that level steady, rising, or falling? Doesn't sound like thermal expansion. Step back and give us some wider shots of near-boiler piping. We need to see more. All of my rads would bang on cool down - sounded like random strikes with a hammer every few minutes. Turned out the radiator feet had dug themselves into the hardwood floor and I put plastic shims under the feet to allow the rads to slide when they heat up and cool down - no more banging. One of our radiators likes to emit a single, deafening "KER-LANG" when heating up or cooling down. However, multiple loud popping noises sounds a bit more like water hammer. Wider shots of the near-boiler piping would definitely help. 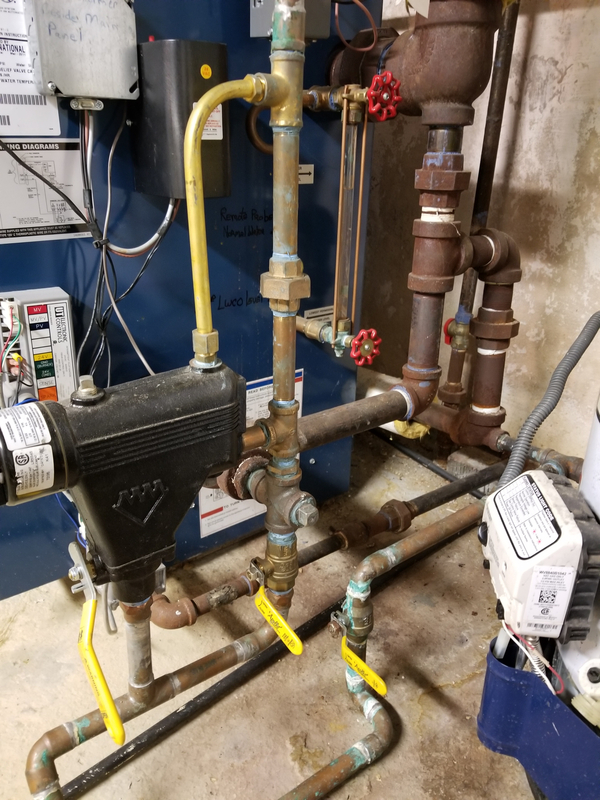 If you could record the noise and post it, that would help us determine if it is expansion or hammer but from what you describe, it sounds more like water hammer. More near boiler piping pictures attached. > If you could record the noise and post it, that would help us determine if it is expansion or hammer but from what you describe, it sounds more like water hammer. I have water hammer where the mains sag and this sounds distinctly different, but maybe this is just the difference of that sound in a radiator vs the main. I'll see if I can record it tonight. post a picture of the top of that insulated pipe , from the top of the boiler to the ceiling. did the pro check and clean either of the pressuretrols ? what's the high pressure you see when she runs? well at least he(installer) has the steam coming out of the correct hole. then I went and found pg10 also. Once I read Dan's book I knew I was going to be in for it with the way the riser doesn't make a loop. > post a picture of the top of that insulated pipe , from the top of the boiler to the ceiling. > Also did pro adjust pressure up? Should be 1/2 psi with 1 diff on additive or 1.5 psi cutout with 1 psi diff on subtraction style pressuretrol. > did the pro check and clean either of the pressuretrols ? > what's the high pressure you see when she runs? I went back over the notes he left and he didn't mention the pressurtrols. definately not pg 10 material. 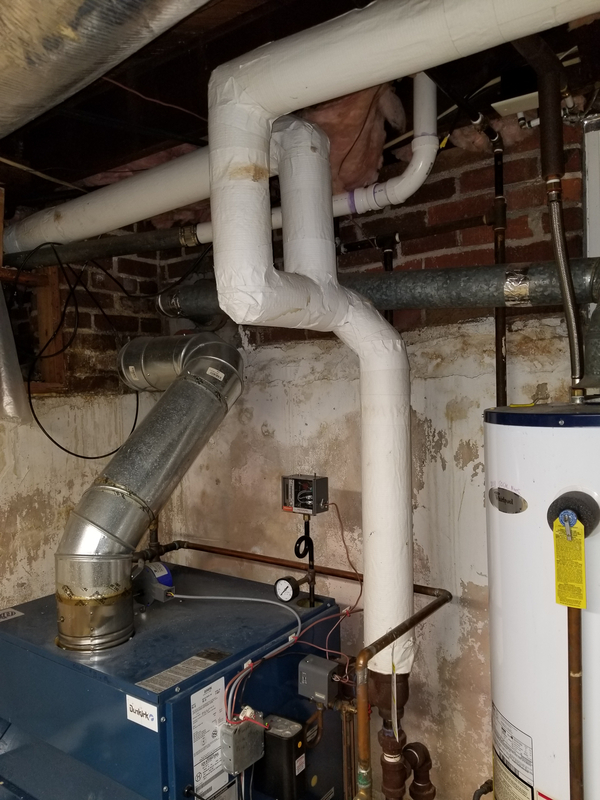 how old is the install and boiler? On that size Dunkirk, one riser from the boiler will NOT work. This is probably one big reason for the noise. Water is getting up into the steam piping, and that improper piping can't stop it. You need two 2-1/2" risers into a 3" header. Only then will the steam be dry enough that it shouldn't bang. > definately not pg 10 material. 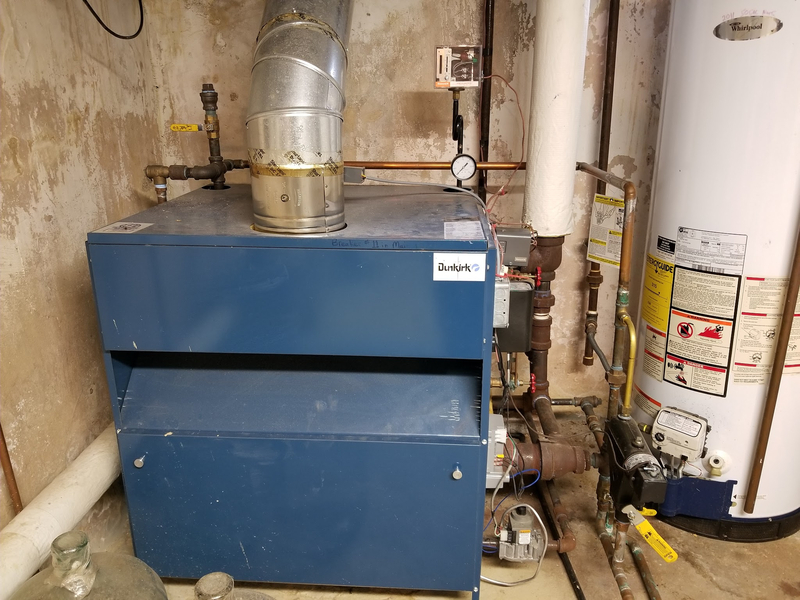 > how old is the install and boiler? > and where are you located? I bought the house 2.5 years ago but I found the original receipt the previous owner left. It's 7 years old. 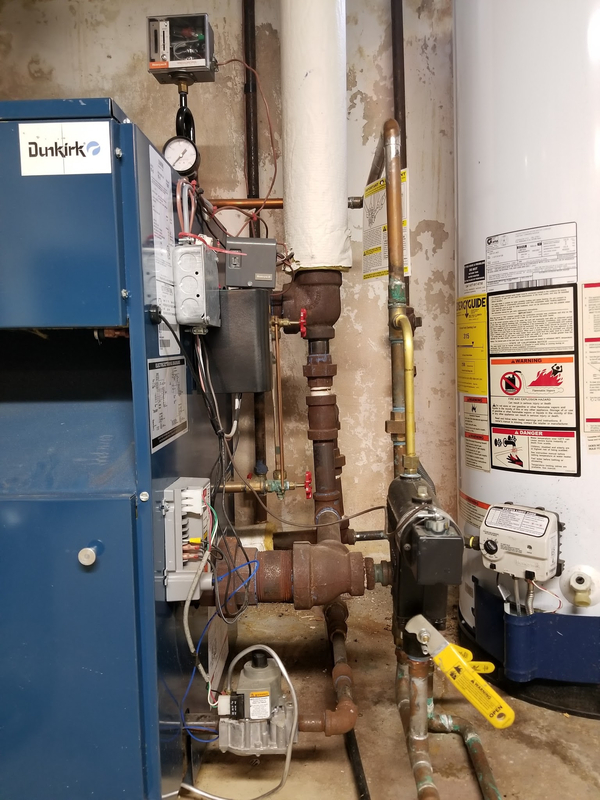 does the boiler EDR match the radiation in the house? based on the pipe work you have to be suspicious of the boiler size also. IF, , , , it's sized correct you may not see much movement on the 30 # gage. or beyond if the pigtails are clogged and not controlling burner run. And if the pigtails are clogged, and you're building too much pressure, then that throws more wet steam up your poor piping, and sure could lead to hammering issues, and a whole lot more like damaged vents also. that's a good start to your future.